Elephant grounds may or may not be pioneers of the ice cream sandwich trend in Hong Kong, but they’ve definitely created a league of their own with their perfectly structured and beautifully decorated mini frozen creations. Each new flavour looks meticulously crafted, but its taste is always equally impressive. It’s no wonder they always sell out before 1pm on weekends! …or so I heard! In fact, I don’t frequent as often as I’d like to because they’re hidden at the back of their woaw store all the way in Sheung Wan and their larger store is all the way in Wong Chuk Hang. But the great news for Kowloon people like me is that they now have a pop-up store in K11 (until 31 August 2015), serving coffee and ice creams! 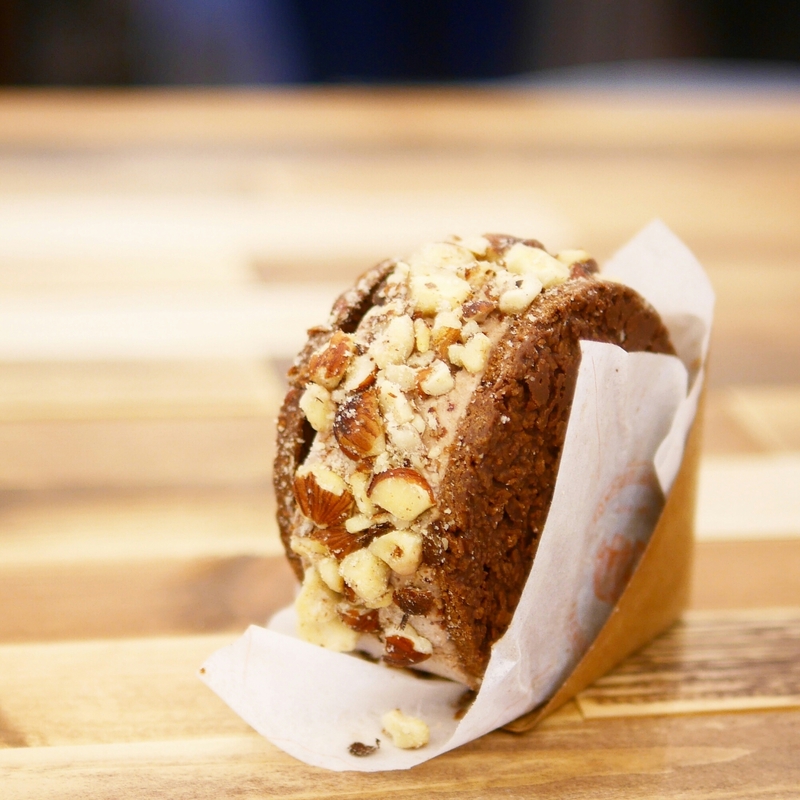 The “Terror Richer” is the ice cream flavour exclusive to this pop-up store (and the only ice cream sandwich sold there) and features a DELICIOUS crunchy cookie and hazelnuts surrounding the ice cream. They also have a handful of other interesting ice cream flavours that are equally unmissable. I tried their Thai tea and honeycomb flavour and I promise to be back for more of those. I also heard great things about their coffee toffee flavour. They also serve coffee here which was decent though not my favourite. It’s quite dark roast and bitter-tasting, which I used to love, but their milk could’ve been thicker and creamier, to be pedantic. Make sure you visit before 31 August 2015! For more coffee posts, click here. For more recommendations around Tsim Sha Tsui, click here.